Are you eager to buy the new iPhones 2018? If so, you should read this article to find out how to transfer to new iPhone without losing any important contacts. The new iPhone 2018 models are out! This year, Apple has decided to simultaneously roll out three new iPhones — iPhone XS, iPhone XS Max, and iPhone XR. All of these iPhones come with a lot of advanced features and specifications. In fact, so much interest has been generated for them that a lot of Android users want to switch over to an iPhone now. However, that raises the question of how to migrate their contacts from one phone to the other. In this article, we’ll give you 4 popular methods by which to transfer to new iPhone without losing out on essential data. So read on to find out how to transfer contacts from Android to iPhone XS, iPhone XS Max, or iPhone XR. The ultimate 1-click solution to transfer to new iPhone is using dr.fone - Switch. This is the most efficient solution out there because it can transfer all your files with the click of a button, and within 5 minutes. Transfer all your contacts from Android to iPhone with the click of a button. Takes just about 5 minutes for the transfer to complete. 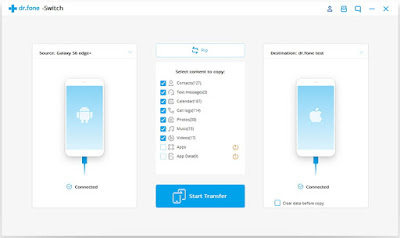 Transfers data from any Android phones to any iPhone model, including the new iPhone XS, iPhone XS Max, and iPhone XR. Works with all major providers like AT&T, Verizon, Sprint, and T-Mobile. 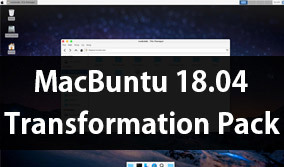 Can be used on all Windows and Mac OS versions. Transferring contacts from Android to iPhone XS Max is literally just a 3-step process. 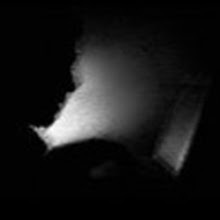 Download and launch dr.fone - Switch on your PC. Simultaneously connect both your iPhone XS Max and your Android phone to the computer using data cables. 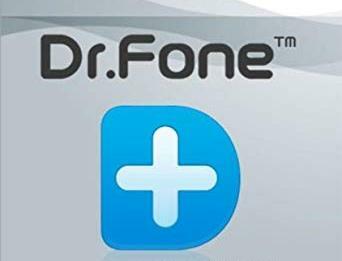 dr.fone will automatically detect the phones. Select the “Switch” feature in the main menu. Now you have to select the ‘Source’ and ‘Destination’ phones. The Android phone is the former, and the iPhone XS Max is the latter. Use the ‘Flip’ button at the top to interchange their positions. From the menu listed with file types, select ‘Contacts’ and click on ‘Start Transfer’. A progress bar will show you as contacts are transferred and then it will be marked ‘Success’ once the transfer is complete. 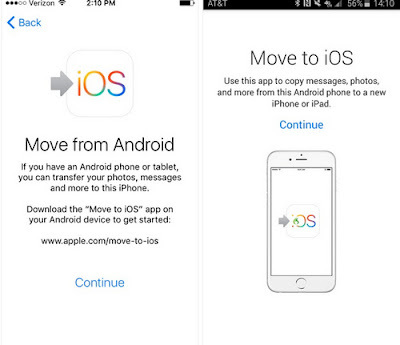 From the Play Store, download the “Move to iOS App”. Start setting up your new iPhone XS Max. 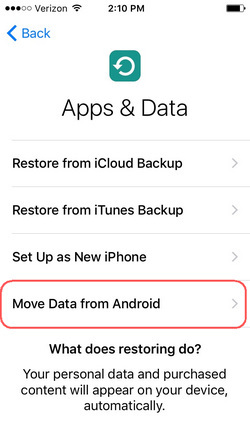 In the App & Data screen, select the “Move data from Android” option. 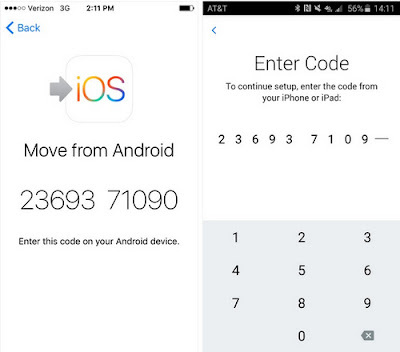 On your iOS, you’ll find a security code. Enter it in your Android app to connect the two of them. From the list of content types available, select the ‘Contacts’ option. Click on ‘Next’ to start transferring the contacts to your new iPhone. In your Android phone, go to Settings > Accounts > Google, and turn on the Contacts switch. 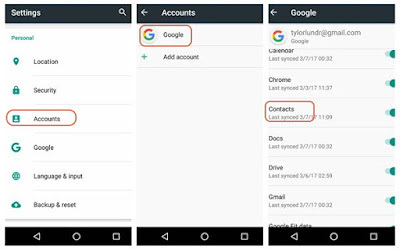 This will send all your Android contacts to your Google account. In your new iPhone XS Max, go to Settings > Mail, Contacts, Calendars > Add Account > Google. 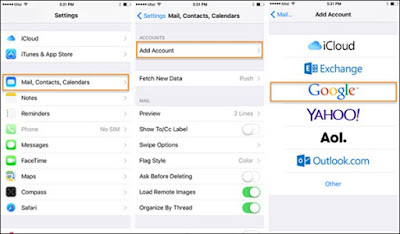 Now enter your Gmail details and sync your Google account to your new iPhone. 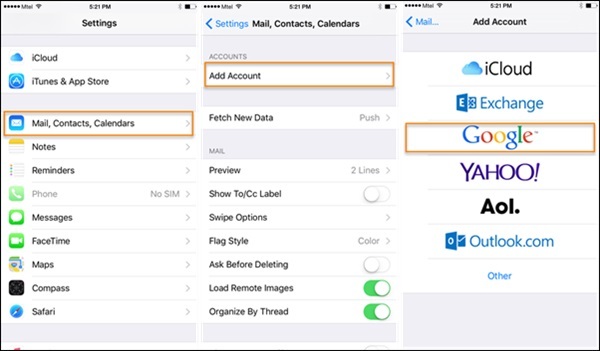 Go to Settings > Mail, Contacts, Calendars > Gmail. This time, toggle on the ‘Contacts’ switch so that all your contacts get synced to your new iPhone. 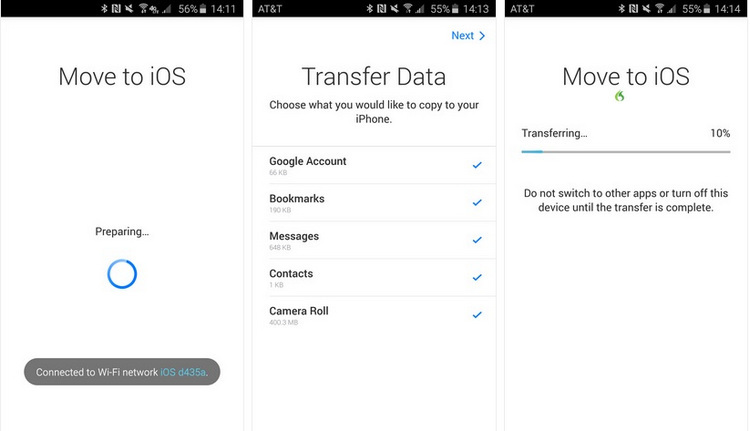 With these simple steps, you’ll be able to transfer contacts to new iPhone. 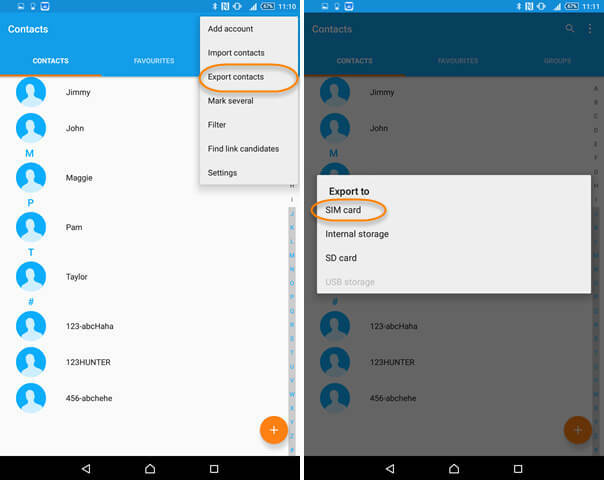 In your Android phone, go to Contacts > More > Export Contacts > Export to SIM Card. Now select the source of the contacts. Click on Export > Continue. Remove the SIM card from your Android phone and enter it into your new iPhone XS Max. All the contacts will get transferred to your new iPhone. 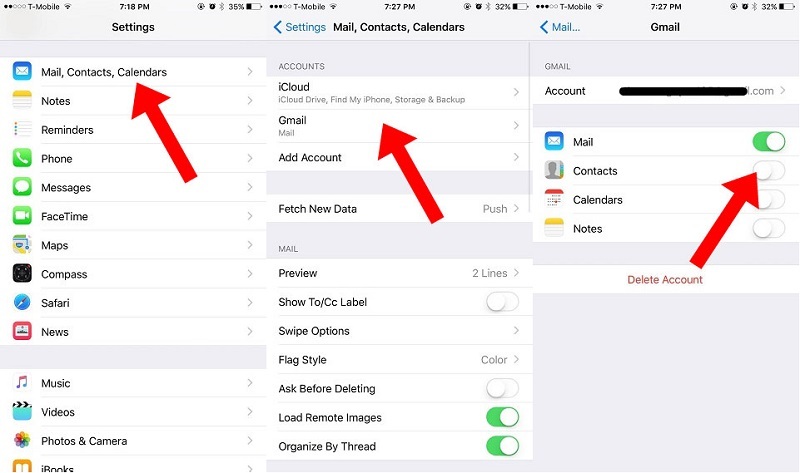 In this article, we showed you 4 popular tricks to transfer contacts to new iPhone. However, my personal recommendation is to use the dr.fone - Switch method as it’s easy and takes only a few minutes. Compared to that, the others have several drawbacks. Move to iOS app method can only work on an iPhone that hasn’t yet been set up and is connected to the internet. The Google method also only works if you’re connected to the internet, and if you have a Google account. And the SIM card method is unreliable as all your contacts might not get stored in the SIM card.